Finally some good news for the bulls. After years in which pension funds had to rebalance at the end of every quarter by selling stocks to buy bonds due to the chronic relative outperformance of the former and the need to keep portfolios balanced, in Q4 returns have been flipped on their head with stocks suffering the worst quarter since the 2008 financial crisis while bonds are sharply higher. Which also means that, as Wells Fargo calculates, U.S. defined-benefit pensions will need to implement a "giant rebalancing out of bonds and into stocks", with the bank estimating roughly $64 billion in equity purchases over the next 6 trading days. 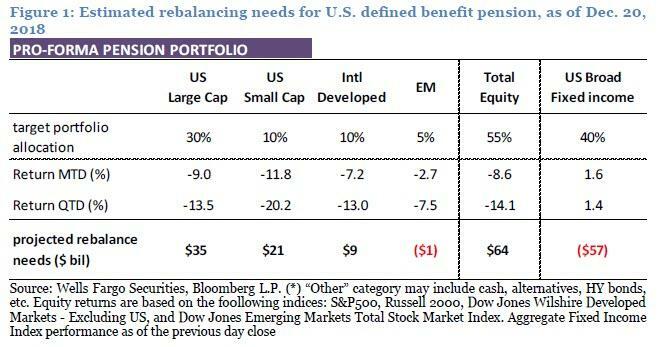 So are traders about to make pension rebalancing "great" again (as Wells Fargo torturedly asks)? Perhaps; the problem is that the sudden deluge of last minute buying may simply be too much for the market to handle, as liquidity has collapsed to the lowest level on record . According to Wells investors and traders looking for a desperately needed respite from market gyrations may have to deal with yet one more "seismic bout" of volatility before Dec 31 finally pops up on their calendar dials. Where does this massive rebalancing come from? As Wells explains, the huge shift is precipitated by the jarring divergence between equity and bond performances both in Q4 and the month of December. The stocks in the bank's pro forma pension asset blend have suffered a 14% loss this quarter, including about an 8.5% drop in December. Contrast this with a roughly +1.6% quarterly total return for the domestic aggregate bond index. The gap between equity and bond performance in pension portfolios would have been even larger had IG credit OAS not widened nearly 40 bps in Q4. The need for massive quarter-end rebalancing means that corporate pensions may need to boost their equity portfolios by as much as $64 billion into year-end. Getting a bit more granular, Wells analyst Boris Rjavinski writes that domestic stocks – both large cap and small cap – may need disproportionately large boosts of $35 billion and $21 billion, respectively, compared to “only” $9 billion for global developed equities (see table above). This is driven by large performance gaps within equity markets: U.S. stocks have trailed global and EM equities in Q4 and December after outperforming the ROW for quarters on end. Meanwhile, on the bond side, pensions may be looking at a historically large outflow of about $57 billion. Some pensions rebalance every month and some only at quarter-end. Since bonds trounced equities both on a quarterly and monthly basis, the flows from the two groups of rebalancers will go the same way. This should amplify the market impact. So what will pensions buy (and sell)? According to Wells, most of the initial outflows from fixed income to be affected via liquid Treasury futures contracts. Consequently, the TY and U.S. sectors should underperform potentially for most of the brief trading window next week. 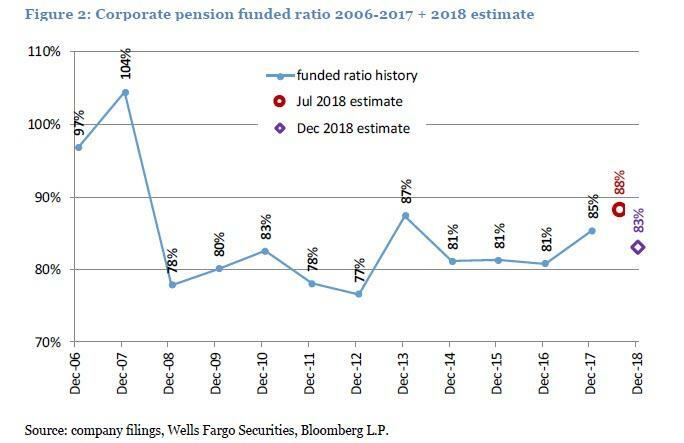 Stepping back from the their immediate rebalancing needs, and focusing on corporate pension performance in 2018, the San Fran-based bank notes that defined-benefit company pensions just cannot seem to catch a break: consider that just a few short months ago, corporate pensions’ average funding ratio seemed poised to top 90%m and stood at 88% in July, up from 85% at the end of 2017. Alas, the good fortune proved fleeting, and the updated Well Fargo estimate pegs average solvency at 83%. The drop for 2018 is no surprise with equities posting hefty declines while long-term Treasury yields are up only 30-35 bps. As a result, pension trustees face an unenviable task of going back to the drawing board, while company Treasurers may be looking at writing another sizeable check to shore up their pensions. For now, however, buckle up for what may be the single largest quarter-end pension rebalancing in history..